A venerable old variety originating in New York in the early 1700’s. It is generally believed the apple arose on the estate of Gershom Moore in what is now known as the borough of Queens, NY. The first Moore to settle in the region may have brought a tree from England in 1666. In 1838 Queen Victoria was presented with two barrels of American-grown Pippins. She so thoroughly enjoyed the apples she immediately lifted the English import tax on apples. This opened the door for the import of hundreds of thousands of tons of fruit from the US to England through the end of World War I when England reinstated the import tax. There are two recognized Newtown Pippins – Green Newtown Pippin and Yellow Newtown Pippin. One is the originator of the other, but as to which came first is unknown. 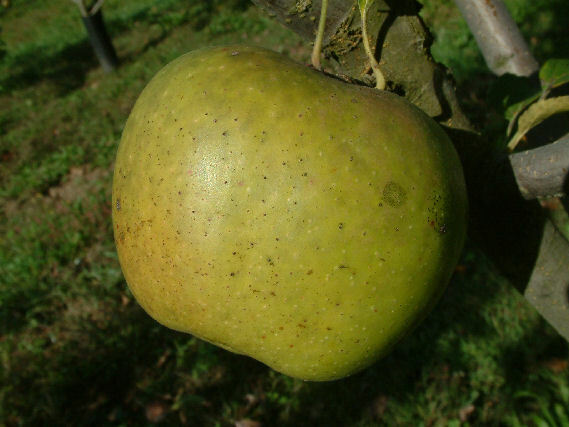 Yellow Newtown Pippin is the most well known and a long-time southern favorite. 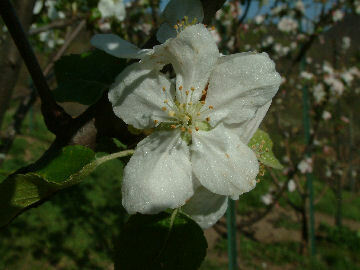 It is a medium to large apple, greenish-yellow in color with hints of pink at the stem end. The yellowish flesh is firm, crisp, and very aromatic. A good storage apple ripening in October and keeping into February or later.